People have conversations every day. Sometimes these conversations are about the big issues of race, religion, gender, and politics. But more often than not, they are about common everyday concerns. At work, conversations involving feedback regarding performance issues are difficult for both managers and employees. In families, conversations about disciplining children and sharing of household chores are often difficult. Neighbors get into damaging arguments about dogs, noise, and parking problems. Most people wish they could avoid conversations about money with their spouse, children, parents, and siblings. You may put these conversations off for as long as you can because you know they are likely to involve a heated argument, blame, accusations or end up in an emotional outburst of tears or anger. You might think that you would make a fool of yourself, damage a relationship, or make it impossible to have a positive relationship with the individual in the future. At the same time, you probably realize that swinging from stony silence into emotional rage is not good in any relationship. You talk too much. When you talk about something that is sensitive, personal and difficult, you may talk around the subject, avoid being specific, try to be polite and hope the other person will somehow pick up the meaning of what you want to say. Think about what you need to say, and then choose the simplest way of saying it. The fewer words you use to open a conversation and explain the problem as you see it, the easier the conversation will be. You think you know everything. When you feel strongly about something, you are usually convinced that you have all the facts available to you. You are also quite sure that you are right. Thus, when you initiate the conversation, you primarily want the other person to agree with you. However, the reality is that no one ever knows all the facts and you are not always right. Start your conversations by being willing to listen and consider the other viewpoints. You blame everyone except yourself. It is tempting to see every problem as being someone else’s fault. If the other person performs to your standards or your rules, then there would be no problems. The fact is that if you are a part of the situation, you are in some way also a part of the problem. Are you sure you made your ideas clear? Did you clarify priorities? Did you set clear standards? Did you get commitment to accept those standards? You need to remember that you may be as much part of the problem as anyone else. You go straight to action. It is tempting to offer an immediate solution to the problem, so you can end the conversation abruptly. Avoid this temptation and slow down. Open yourself up to listen to all points of view and acknowledge the other person (or people) involved so they know that their opinions have been heard. If you push too quickly for your own solution, it is likely that others will not be committed to the outcome. You will think you have solved the problem only to find that nothing changed and you have not resolved the situation. 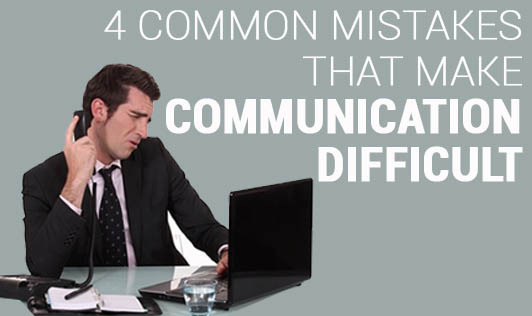 If you can avoid these 4 mistakes, you will find that your communication skills will improve noticeably.